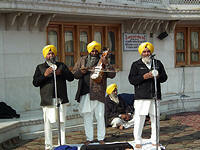 Today we took the long 5-6 hour drive to Amritsar. We arrived in Amritsar in the afternoon and checked in at the 5* Hyatt hotel. Because that day was New Year's Eve our local guide was keen for us to see the famous Golden Temple before the change of the year. We left the hotel at around seven thirty, along with many other hotel guests all heading for tonight's Palki ceremony at the Golden Temple. Our guide told us that it was special as it was the last for 2014. The heavy traffic and the large crowds began to gather at the temple entrance. I was very glad that our guide told us to buy the yellow headscarf offered by many hawkers outside the temple to cover our head. We also took off our shoes and socks and waded through the water bath onwards to the steps up to the temple. On this cold December night I found my bare feet particularly cold walking on the marble floors. Constantly I walked onto the carpets and rugs laid out on the floor for sitting and standing but unfortunately most of them were very wet too. As soon as we entered the temple complex and saw the Golden Temple emerging from the distance it was all worth the discomfort.The Golden Temple was shining beautifully in the dark on its platform in the centre of a man-made lake, a long walkway connecting the temple to the edge of the lake. 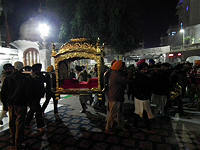 At around nine o'clock the Palki ceremony began with a group of 8 to 10 men carring the heavy and beautiful golden palanquin along the walkway to the Golden Temple iteslf. Inside the palanquin the holy book Guru Granth Sahib is laid on a red cushion and carried back along the walkway to a special room inside a palace overlooking the lake, where it rests overnight. The crowds, the noise and the chanting and singing by the palanquin bearers and workshippers following the procession were exciting. It was so crowded I was just able to see the crown on top of the palanquin moving above a sea of coloured headscarfs and turbans, all the while garlands of flowers were placed on top of the palanquin during its short journey. The atmosphere was extraordinary powerful and spiritual. I was overwhelmed. Reaching away from the entrance to the walkway was a long queue of people waiting their turn to go down to the Golden Temple itself to pay their respects and pray. I was told this queue would be like this throughout the night as people kept arriving to do their turn. The whole Palki ceremony is very attractive to watch regardless of the religious and spiritual implication. 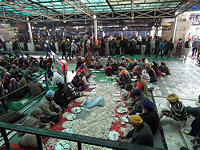 The same ceremony takes place every day in the evening, and the following morning at dawn when the holy book is carried back from its resting place to the Golden Temple in the lake centre. We left the temple complex at around ten o'clock to return to our hotel for our late-starting New Year's Eve dinner. As we left there were people everywhere in the temple still worshipping, praying, sitting and possibly sleeping there on the cold marble floor until dawn. On the first day of the year 2015 we returned to the Golden Temple for a morning visit. 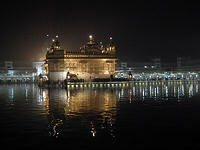 The revisit is a must as the daylight and atmosphere of the Golden Temple is completely different to evening ceremony. There were also crowds but nothing like last evening's visit. There were now bathers in the lake taking the holy water. We circled the lake and entered another interesting part of the temple complex, the Kitchens. 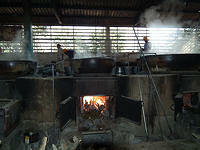 Here food is prepared and served to between fifty and a hundred thousand people every single day. In different parts of the kitchens, groups of people, mostly volunteers, prepare different foods, such as chopping the garlic and onion, preparing curry and rice in great steaming vats and producing thousands of chapattis. In another part, dozens of volunteers wash up the stainless steel plates and bowls. All of this food is provided by members of the community, and everybody, rich or poor, young and old helps in some way to prepare, serve or clear the food. It feels like a very happy community where everybody is looking after everybody equally. Our local tour guide told us that there are many millionaires voluntarily working in the kitchen or in the cloakroom helping people. The whole temple complex has a feeling of sharing, loving, believing, worshipping and above all equality and happiness. On our day visit there were some musicians there performing in the temple square and people were gathered round enjoying the music. We listened and enjoyed it too. We left the temple and walked through an interesting crowded local market to the famous Jallianwal Bagh. This rather ordinary park and gardens used to be a waste ground where on April 13th 1919 British soldiers opened fire on a gathering of about five thousand local people who were protesting against the introduction of the Rowlatt Act. The crowd was trapped as there was little escape and many hundreds of people were slaughtered. On the high walls of the courtyard bullet holes are still visible. It is a haunting image of the past history of power and colonialism. 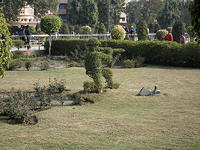 Today visitors, local family and children visit the park for leisure. 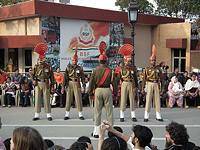 The last event of the day was to drive to Wagah for the daily sunset flag-down ceremony when members of the Indian and Pakistani military meet at the border between the two countries for the lowering of the flags and closing of the border gate. This event is highly stylised and entertaining with bright and colourful military uniformed soldiers marching and performing for the event in a very theatrical way. Next morning we visited a few hotels and chose the 5* Hyatt for our Deluxe hotels category and 4* Holiday Inn for our Superior hotels category. We flew back to Delhi in the evening, to connect with our flight back to the UK. This has been a very enjoyable and interesting trip particularly The Golden Temple in Amritsa, Shimla town, and the local rail journey. 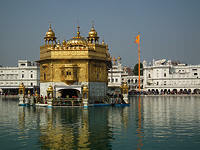 I have worked out a 10 day itinerary based on this trip, The Himalayan Foothills and the Golden Temple. Try it and you will enjoy it too.